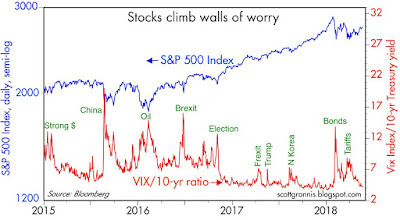 As Chart #1 shows, the market's degree of anxiety (proxied by the ratio of the Vix index to the 10-yr Treasury yield) recently has settled back down to relatively low levels. Prices have drifted higher, though they have yet to return to their January '18 highs. The market has digested the impact of higher yields, and Trumps' tariff wars have failed to materialize. In fact, there appears to have been a measure of progress with regards to relations with China and North Korea. In the absence of unexpected distress, and in the presence of rising profits, equity prices are floating slowly higher. 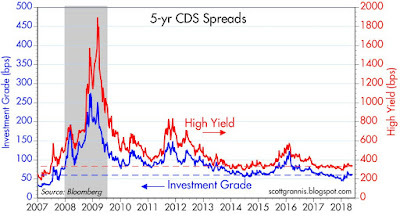 As Chart #2 shows, Credit Default Swap spreads are trading at relatively low levels. 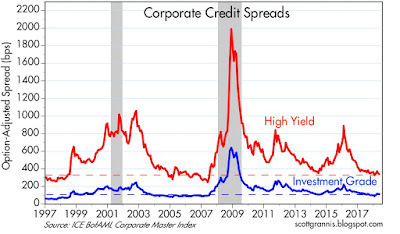 These spreads are an excellent, market-based proxy for the outlook for corporate earnings. Investors are saying that it doesn't get much better than this. 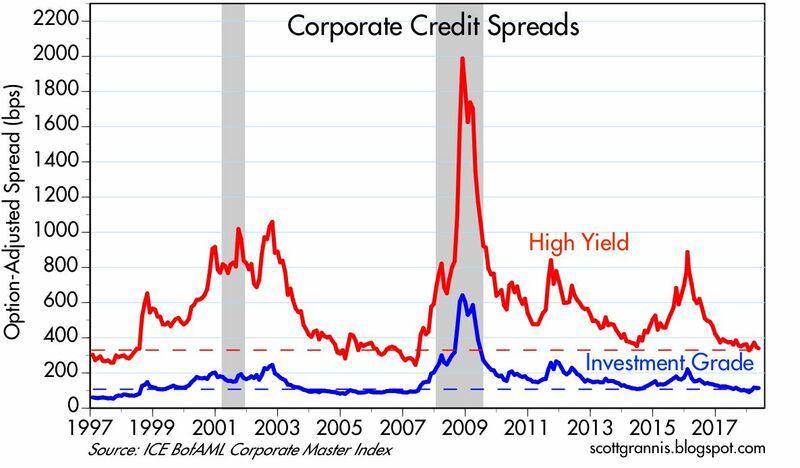 Chart #3 tells the same story: credit spreads in general are low, which implies that the market is confident in the future of corporate earnings. Chart #4 focuses on 2-yr swap spreads in the US and Eurozone. 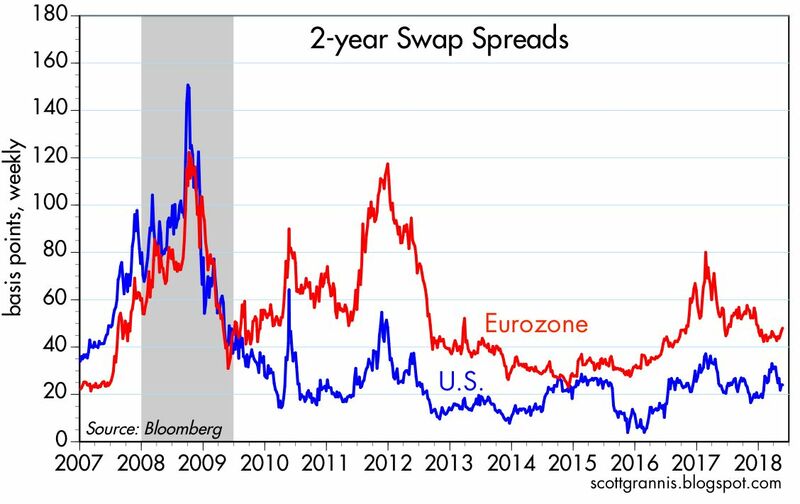 US 2-yr swap spreads at current levels are also about as good as they get, which in turn suggests that credit markets have plenty of liquidity and systemic risk is very low. This further suggests that financial market fundamentals are strong, and that is consistent with improving economic growth conditions. 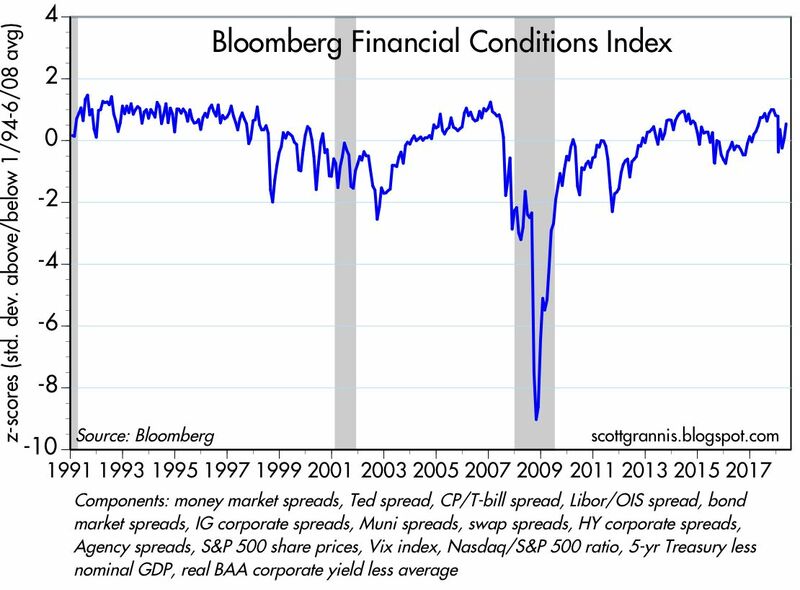 Chart #5 shows Bloomberg's index of a variety of market-based indicators of financial conditions. 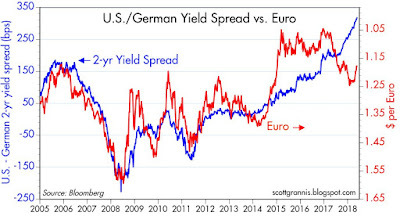 It too is a sign of low systemic risk and improving growth conditions. Chart #6 compares the real yield on 5-yr TIPS with the 2-yr annualized rate of growth of the US economy. This shows that there is a connection between prevailing real economic growth rates and real interest rates; both tend to rise and fall over time. 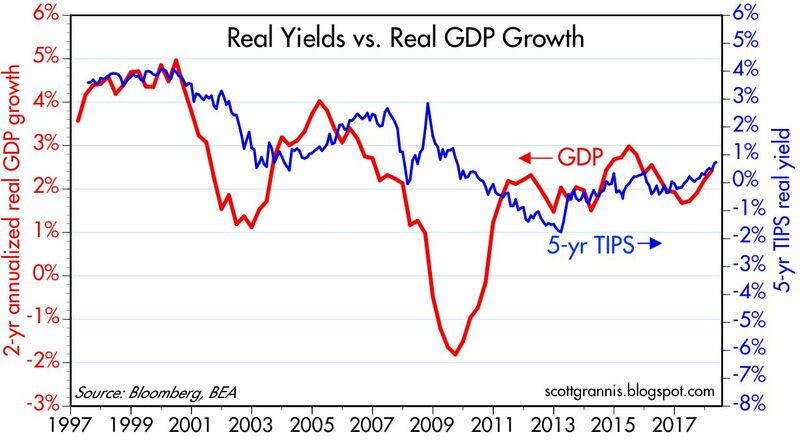 The modest rise in real yields which began last year has coincided with a modest increase in the economy's growth rate. The bond market senses that growth fundamentals are improving, but by no means has the market become overly optimistic. 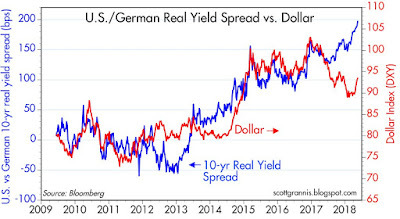 Chart #7 and #8 compare international interest rate spreads to the value of the dollar. 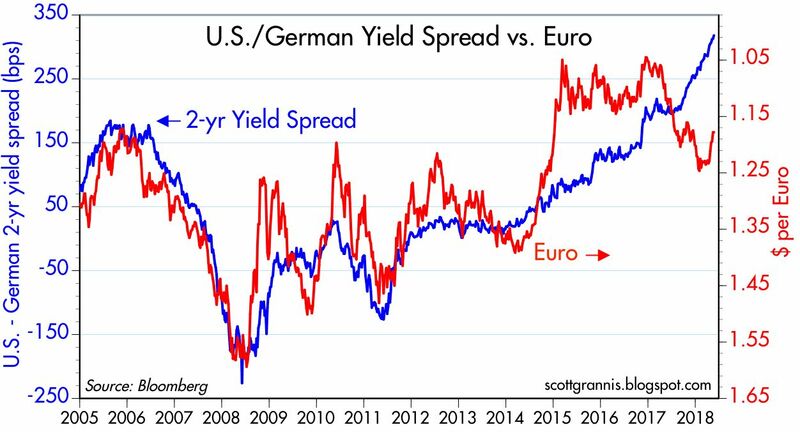 It's important to note that nominal and real interest rates spreads between the US and the Eurozone today are at record highs. 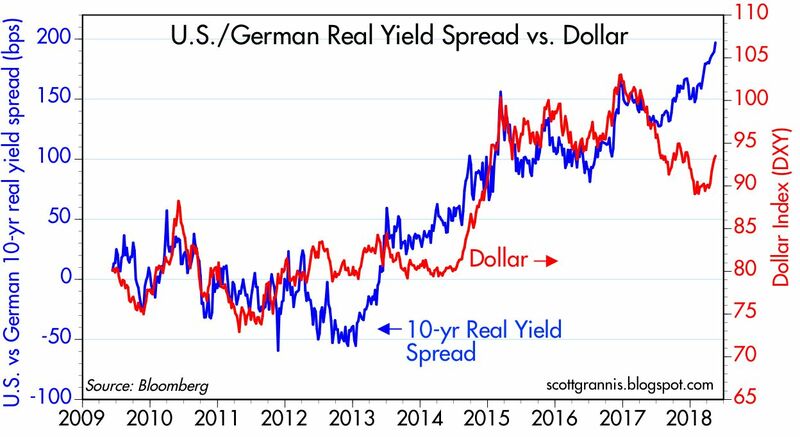 With spreads sharply in favor of the US at present, it is very tempting to think that the dollar has significant room to appreciate. Chart #9 shows that excess bank reserves have declined about 30% from their all-time high. 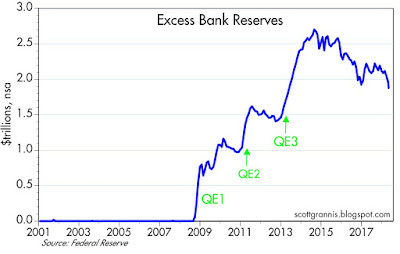 This is the result of 1) increasing levels of bank deposits, which require banks to hold a certain level of bank reserves as collateral, and (mostly) 2) the gradual shrinking of the Fed's balance sheet, which has largely been accomplished by not reinvesting the proceeds of maturing securities. This should not be mistaken for Fed "tightening," however. QE was not about printing money, and the gradual unwinding of QE is not about tightening. This is best viewed as the Fed reversing part of its massive injection of dollar liquidity that began almost 10 years ago, a move that was designed to supply risk-free T-bill substitutes to a market that was desperate for safe and liquid assets. Today the demand for safe money is declining, so it is entirely appropriate for the Fed to be shrinking its balance sheet. 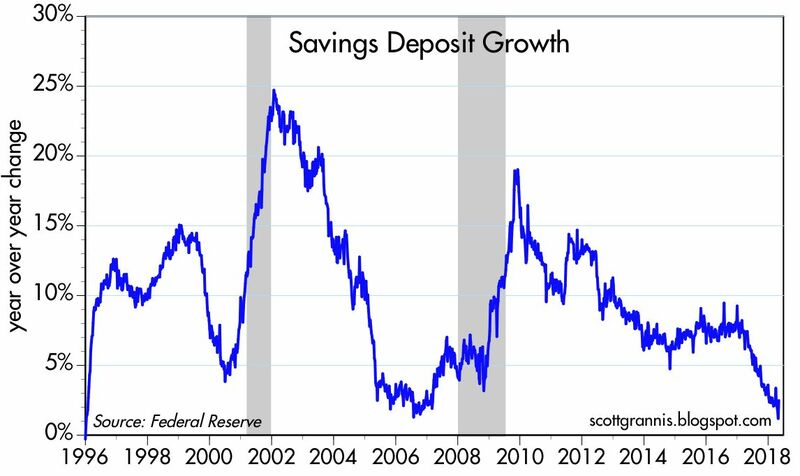 Chart #10 shows the significant decline in the rate of growth of bank savings deposits, a process that began in early 2017. Savings deposits account for about two-thirds of the M2 money supply, and they mushroomed from $4 trillion at the end of 2008 to now over $9 trillion. 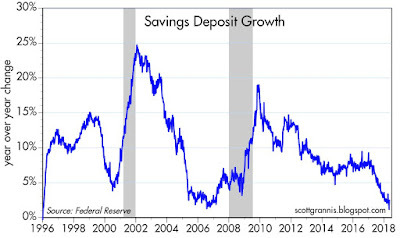 I consider bank savings deposits to be excellent proxies for the demand for money, especially over the past decade, since they have paid almost nothing in the way of interest. People poured trillions of dollars into bank deposits not for their return, but for their safety. But now the era of strong demand for money has ended. 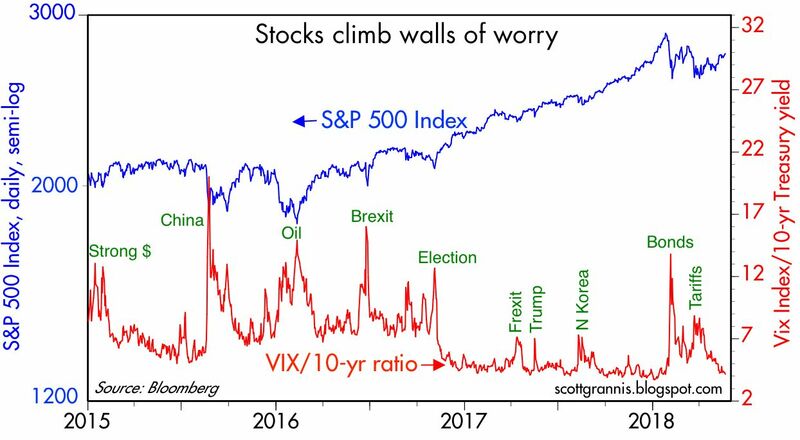 Confidence is up, and people are attempting to shift their portfolios away from risk-free assets to more risky assets. 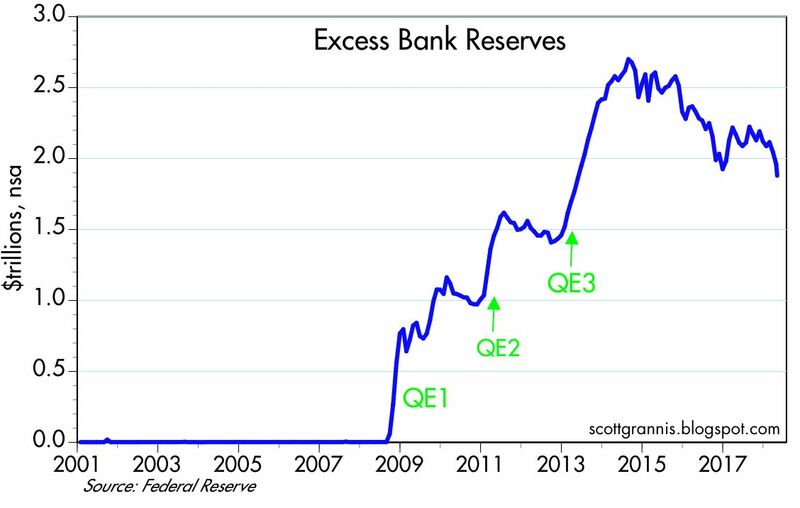 The Fed absolutely needs to reverse QE to accommodate this, lest the financial system finds itself with excess money—a condition that would likely foster an unwanted acceleration of inflation. 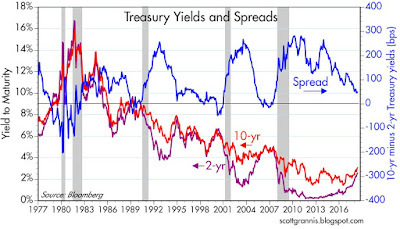 Chart #11 gives you the big picture behind the Treasury yield curve. The curve has flattened substantially in recent years, and this is typical of economic expansions. It is also typical of periods during which the Fed is raising short-term interest rates. 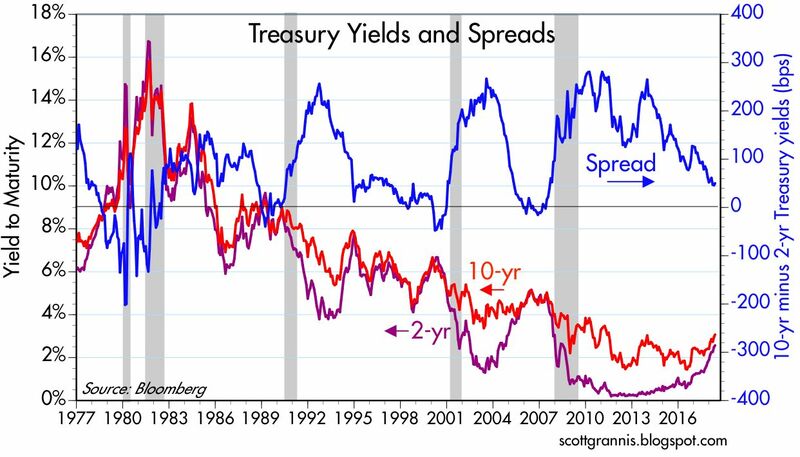 Much has been made of the flattening of the yield curve, because flat and inverted yield curves typically have preceded recessions. 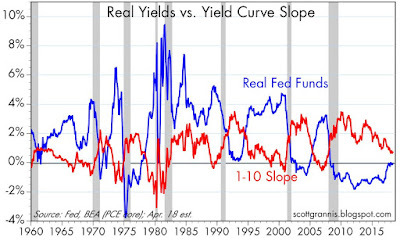 But the curve is not flat, it is still positively sloped, and it has been this way several times in the past when recessions were still on the far horizon. 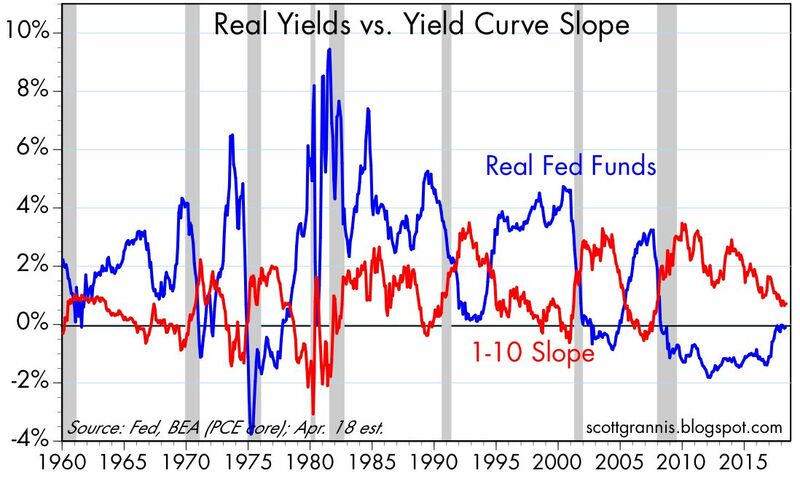 Chart #12 adds more information to the shape of the yield curve, since the yield curve is only one way that the Fed acts on the market and the economy. 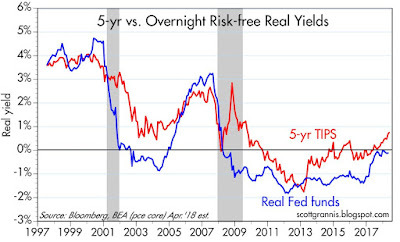 The other key variable is the real Fed funds rate (blue line). 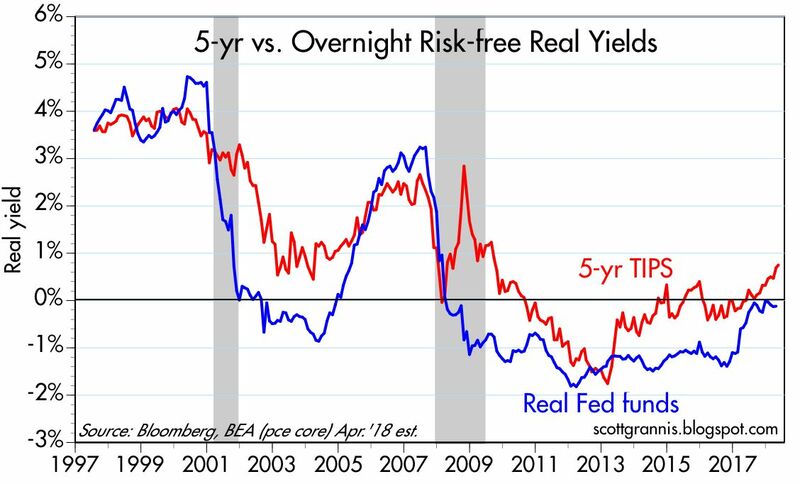 Recessions are reliably preceded not only by a flat or inverted yield curve but also by a significant increase in real borrowing costs. 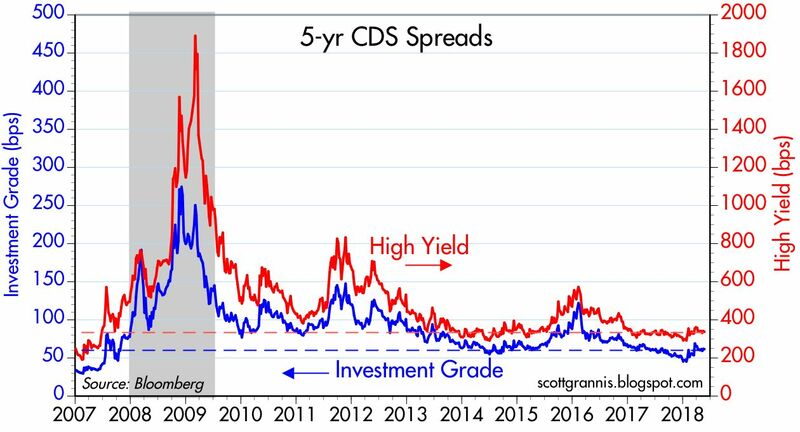 Today, short-term real borrowing costs are effectively nil. The Fed is not tight. Chart #13 compares the current real, inflation-adjusted Fed funds rate (red line) with what the market expects the real funds rate to average over the next 5 years (red line). Here we see that the market fully expects the Fed to continue raising short-term interest rates gradually over the next several years. If there were any hint that the economy is weakening, the market would be expecting the Fed to stop raising rates and/or to begin to lower rates in coming years. That is not the case today. 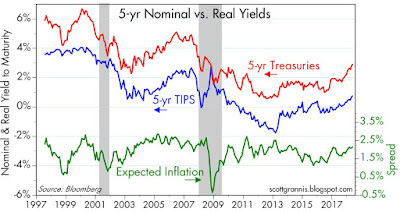 Chart #14 shows the history of nominal and real 5-yr Treasury yields and their spread (green line), which is the market's implied forecast for what the CPI will average over the next 5 years. 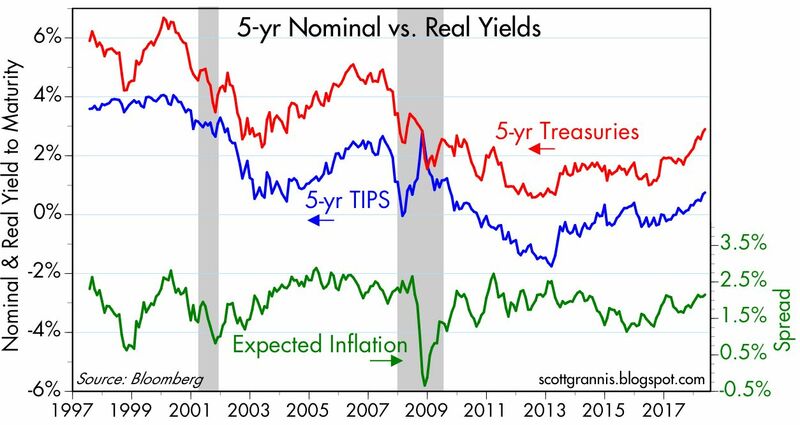 Here we see that despite all of the supposed "money printing" of the past decade, inflation expectations are well anchored. The bond market fully expects that inflation in the years ahead will be just about what the Fed is targeting, i.e., 2% or so per year. This further suggests that the Fed has yet to make a serious mistake. It's also worth noting that essentially all of the increase in 10-yr yields from their all-time low of July '12 is accounted for by rising real yields. Yields are higher because the market is more confident about the outlook for real economic growth. This is an optimal development. 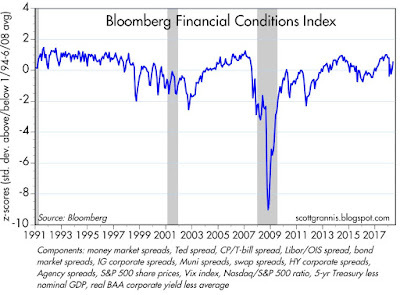 Adding it all up, financial market and economic conditions are quite healthy. Add to the mix the fact that corporate income tax rates have been sharply reduced, and you have a recipe for stronger economic growth, which will likely be a by-product of increased corporate investment. We can't say for sure this will happen, but the evidence is mounting and the market is still only in the early stages of pricing this in. Thank you Scott! Great charts and comments. You can agree or disagree with Scott Grannis, but he sure makes a terrific wrap-up and overview of the US economy. And I will always forgive optimism. Without that, why get out of bed, start a business, buy property, get married or anything else worth doing? Let us hope GDP growth perks up. I think it can. I think there is plenty of slack, and we have a global economy anyway. Despite recent fear-mongering, the US imports what it needs, meaning "tight" markets in anything tend to disappear. Name for me one business that says, "We have more work than we can handle. We have been raising prices over and over again to ration demand." You see that price-rationing in property-zoned West Coast real estate...but nowhere else. Name any sector that looks to have more demand than it can handle---please, as an investor I want to know. WalMart? Tesla? Ford? IBM? Microsoft? Samsung? Any local restaurant? Sears? Even the oil titans are plotting artificial production cutbacks (the OPEC thugs). That might work, but only for a while. The Fed, the ECB, the BoJ and the PBoC have lots of room to let it rip. I hope they do so. Channeling both Scott and Benjamin: I'll take the "over" on GDP consensus for 2018 and 2019. And I'll take the "under" on the consensus estimate for the 10-year yield at the end of 2018. Thanks for the charts, Scott. Personal anecdote relating to Benjamin's comment on optimism: I despise both parties but I can't deny the fact that it was something of an effort, most days, to get out of bed during the Obama and Bush years. Despite my personal animus toward Trump, I also can't deny that I bounce out of bed these days, (at least mentally). Thank you Scott - great analysis. The plow horse economy continues and hopefully will start moving faster. Chart #10, the change in the rate of savings offers an interesting correlation with the growth in the federal deficit. When the government spends what it doesn't have, the private sector savings makes up for it.